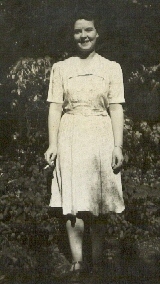 [S45] Website FreeBMD (http://freebmd.rootsweb.com/) "Births Jun 1876 FAIRHURST Emily Gertrude Runcorn 8a 243." [S1051] Website Lancashire BMD (http://lancashirebmd.org.uk/) "LAXTON John M FAIRHURST Emily G 1904 Ormskirk Register Office or Registrar Attended Preston Lancashire RM/48/57." [S70] General Record Office Indexes "Death Dec 1957 LAXTON Emily G 81 Surrey S. E. 5g 904." [S274] Shiela Anscomb, "Email from Shiela Anscomb (3/8/2003) #3," e-mail to Alan Bennett, 3 August 1903. [S49] UK National Census for 1881 Index, UK "RG11/2182 f134 p19." WW1 between 1916 and 1919� He served in the army as a Second Lieutenant (Intelligence) in The Liverpool Scottish Regiment, Second Batallion during The Great War between 1916 and 1919 at France. Marriage* 18 April 1926� Philip St John Basil Rathbone married Ouida Bergere, daughter of Stephen Branch and Ida Williams, on 18 April 1926 at Dutch Reformed Church, New York, New York, New York, USA. [S2117] Website Family Search (https://familysearch.org) ""South Africa, Church of the Province of South Africa, Parish Registers, 1801-2004," database with images, FamilySearch (https://familysearch.org/ark:/61903/3:1:33SQ-GT43-DZF : 2 July 2014), South Africa > Transvaal > Johannesburg, St Mary the Virgin > image 143 of 256; William Cullen Library, Wits University, Johannesburg." [S373] N/a, 'RAFVR Promotions', "Gazette Issue 30997 published on the 5 November 1918. Page 36 of 54. 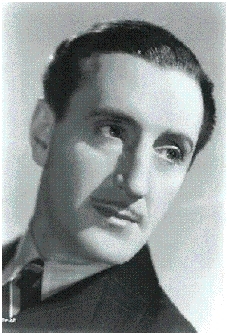 Basil Rathbone June 13 1892 July 21 1967 Person,Grave Ferncliff Cemetery and Mausoleum." [S72] UK National Census for 1891 for UK, "RG12/3583 f91a p42 246." [S704] UK National Census for 1901 for UK, "RG13/4116 f32 p18 80." [S45] Website FreeBMD (http://freebmd.rootsweb.com/) "Deaths Dec 1908 JEFFERSON Alice 25 Halifax 9a 255." [S1109] Website WorldVitalRecords.com (http://www.worldvitalrecords.com) "1662 Sep 14 Andrew f. Rich. Dale, of Thorncliffe bap." [S276] Baptisms/Burials Transcript, St Thomas (Ashton in Makerfield), Bap 1756-1809 Bur 1746-1805 "p102." [S276] Baptisms/Burials Transcript, St Thomas (Ashton in Makerfield), Bap 1756-1809 Bur 1746-1805 "p58." Source: FHL Film 1469059 Dates: 1762 - 1815. [S455] Baptisms/Burials Transcript, St Thomas (Ashton in Makerfield), Bap 1810-1827 Bur 1806-1844 "p3." [S455] Baptisms/Burials Transcript, St Thomas (Ashton in Makerfield), Bap 1810-1827 Bur 1806-1844 "p17." [S455] Baptisms/Burials Transcript, St Thomas (Ashton in Makerfield), Bap 1810-1827 Bur 1806-1844 "p24." [S455] Baptisms/Burials Transcript, St Thomas (Ashton in Makerfield), Bap 1810-1827 Bur 1806-1844 "p34." [S455] Baptisms/Burials Transcript, St Thomas (Ashton in Makerfield), Bap 1810-1827 Bur 1806-1844 "p42." [S455] Baptisms/Burials Transcript, St Thomas (Ashton in Makerfield), Bap 1810-1827 Bur 1806-1844 "p47." [S455] Baptisms/Burials Transcript, St Thomas (Ashton in Makerfield), Bap 1810-1827 Bur 1806-1844 "p123." [S455] Baptisms/Burials Transcript, St Thomas (Ashton in Makerfield), Bap 1810-1827 Bur 1806-1844 "p54." [S596] Baptisms Transcript, St Thomas (Ashton in Makerfield), Bap 1828-1873 "p4." [S455] Baptisms/Burials Transcript, St Thomas (Ashton in Makerfield), Bap 1810-1827 Bur 1806-1844 "p184." [S276] Baptisms/Burials Transcript, St Thomas (Ashton in Makerfield), Bap 1756-1809 Bur 1746-1805 "p99." [S276] Baptisms/Burials Transcript, St Thomas (Ashton in Makerfield), Bap 1756-1809 Bur 1746-1805 "p108." [S455] Baptisms/Burials Transcript, St Thomas (Ashton in Makerfield), Bap 1810-1827 Bur 1806-1844 "p105." [S601] UK National Census for 1881 for UK, "RG11/3601 f63a p44 244." 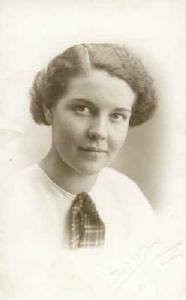 [S45] Website FreeBMD (http://freebmd.rootsweb.com/) "Births Dec 1876 BLUNDELL Mary Ellen Liverpool 8b 48." [S962] Baptisms, St Paul (Seacombe), 13 August 1911-4 June 1916 "p141/1264." [S1051] Website Lancashire BMD (http://lancashirebmd.org.uk/) "Liverpool : 2129LP/5/167." 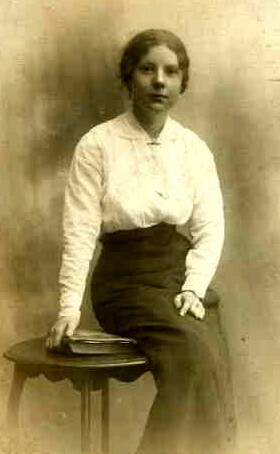 [S45] Website FreeBMD (http://freebmd.rootsweb.com/) "Births Jun 1878 Blundell Sarah Frances Liverpool 8b 167." 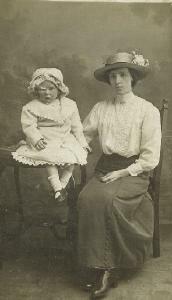 [S45] Website FreeBMD (http://freebmd.rootsweb.com/) "Births Jun 1880 BLUNDELL Martha Liverpool 8b 133." [S45] Website FreeBMD (http://freebmd.rootsweb.com/) "Mar 1842 LIVESLEY James Warrington 20 579 and REEVES Mary Ann Warrington 20 579." [S601] UK National Census for 1881 for UK, "PRO Ref RG11 Piece 3785 Folio 19 Page 34." [S37] Website Cheshire BMD (http://cheshirebmd.org.uk/) "C29/1/366." [S321] Burials, St Thomas, Golborne, 22 Sep 1869-21 Nov 1903 "p185/1479 aged 72 Ashton in Makerfield." [S45] Website FreeBMD (http://freebmd.rootsweb.com/) "Deaths Mar 1888 LIVESLEY Mary Ann 69 Wigan 8c 95." [S586] Baptism, St Luke (Lowton), 1834-1859 "P110/875." [S586] Baptism, St Luke (Lowton), 1834-1859 "P123/980." [S586] Baptism, St Luke (Lowton), 1834-1859 "P139/1107." [S586] Baptism, St Luke (Lowton), 1834-1859 "p163/1299." [S676] Baptism, St Mary, Leigh, 1811-1820 "p61/483 12 March 1814 James son of James and Alice Livesey Westleigh Farmer." [S586] Baptism, St Luke (Lowton), 1834-1859 "p187/1491." 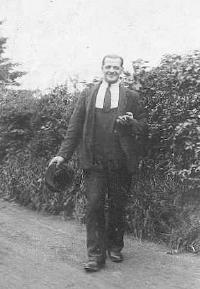 [S45] Website FreeBMD (http://freebmd.rootsweb.com/) "Deaths Jun 1873 Livesley James 59 Wigan 8c 76." [S321] Burials, St Thomas, Golborne, 22 Sep 1869-21 Nov 1903 "p30/238." [S601] UK National Census for 1881 for UK, "PRO Ref RG11 Piece 3785 Folio 19 Page 34 - listed as widowed." [S1051] Website Lancashire BMD (http://lancashirebmd.org.uk/) "Wigan & Leigh : ROW/18/110." [S45] Website FreeBMD (http://freebmd.rootsweb.com/) "Marriages Mar 1864 Seddon James Wigan 8c 77." [S45] Website FreeBMD (http://freebmd.rootsweb.com/) "Marriages Mar 1864Livesley Alice Wigan 8c 77." [S2] UK National Census for 1871 for UK, "RG10/3890 f78 p5 18." [S277] Baptisms, BVRI, FHL Film 1469067 1854-1872. [S635] Original marriage certificate of John Holland and Ellen Livesley, 30 November 1912 "unknown cd." [S56] Index to unknown record type, unknown second location, unknown period "1938 LIVESLEY James of Balmer Farm, Wigan Road, Golborne, Lancashire died 25 Feb 1938 Probate LIVERPOOL 14 Sep to James Livesley retired farmer William Livesley and John Livesley farm labourer. [S673] MI, Ellen, Albert and Peter Cottom Peter. [S1051] Website Lancashire BMD (http://lancashirebmd.org.uk/) "Wigan & Leigh : ROL/43/151." [S2] UK National Census for 1871 for UK, "RG10/3910 f25 p43 201." [S2] UK National Census for 1871 for UK, "RG10/3910 f25a p44 201." [S1001] Burials, St John the Evangelist, Abram, 1839-1899 "4 Mar 1883 John Livesley of Platt Bridge 33." [S322] Baptism, St Thomas, Golborne, 1903-1915 "p104/825." [S3835] National Health Service Register for UK (online image) "Ref: RG101/4959C/008/41 Letter Code: NZRE." [S1116] MI, Benjamin and Doris Brooks. 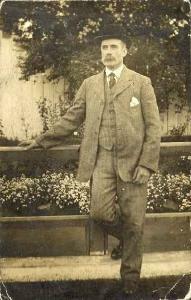 Education circa 1908� He was educated circa 1908 at The Parochial School, Golborne, Lancashire, England, . [S1051] Website Lancashire BMD (http://lancashirebmd.org.uk/) "Wigan : C31/3/425." [S1121] MI, Thomas & Constance Livesley and James Graham Livesley (cremated). [S70] General Record Office Indexes "Births DEC 1911 BROOKS Benjamin ANDREW Oldham 8d 1145." [S70] General Record Office Indexes "Death Jun 1991 BROOKS Benjamin born 8/10/1911 Warrington 35/1200." 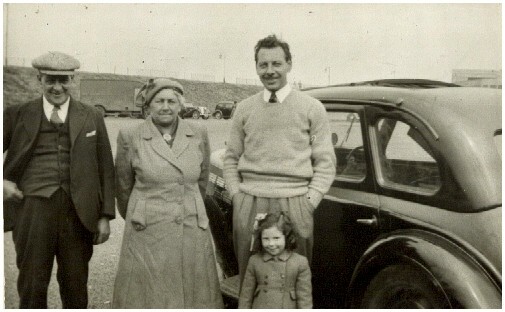 Peter Ward and his wife Maggie (nee Prescott) with son Peter and grand-daughter Pamela around 1955.The car in the background was Peter and Ethels. They always went to Southport to get Pamela some "fresh air" as she had been very poorly with double pneumonia when she was two. [S48] Online index to the UK National Census for 1901 for UK "RG13/3588 f57a p18 114." [S260] Baptism, St Luke (Lowton), 1859-1972 "p161/1286." [S666] Marriage, St Luke (Lowton), 1876-1926 "p213/425." [S72] UK National Census for 1891 for UK, "RG12/3083 f156 p29 172." [S70] General Record Office Indexes "WARD Peter June 1887 Leigh 8c 264." [S704] UK National Census for 1901 for UK, "RG13/3588 f57a p18 114." [S660] Original marriage certificate of Peter Ward and Ethel Holland, 14 June 1947 "unknown cd." 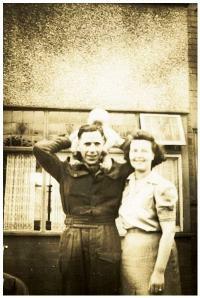 [S45] Website FreeBMD (http://freebmd.rootsweb.com/) "Deaths Sep 1957 WARD Peter 70 Leigh 10d 7."